This was a pretty easy project, just a little labor intensive. This idea came from the fabulously smart Connie @YoungandRelentless. 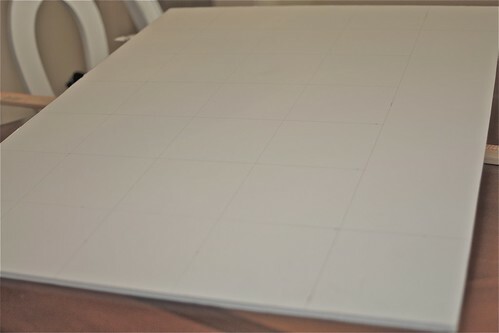 I bought a foam poster board and cut it in half. 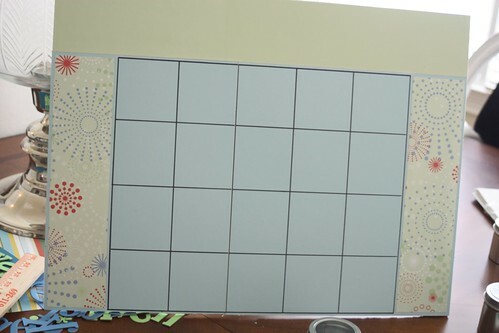 I then used a yard stick to "grid" off the board. You just need to decide how many chores you are going to list and how many days of the week etc. 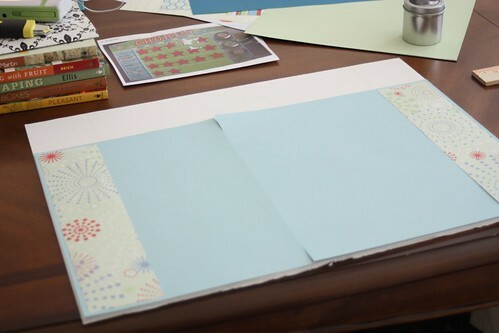 After you have laid out your board, glue down different colors of paper to emphasize the different categories on your chart. I took a black sharpie and outlined the days of the week. I used chip-board letters for the word chores. I used my computer to print off the days of the week. After the basic chart is constructed, you can then print off stars and actual chores (I used the computer again). I laminated the stars and chores. The little tins came from Michael's. I used sticky back velcro to attach the stars, chores & tins. Max has been using his chore chart this week and loves it! I think the element of surprise in those little tins is totally motivating. PS. Some of you will notice one of Max's chores says "Ladybugs". Everyday from school Max comes home with a little ladybug chart that has been colored in if he has followed the classroom's rules. So, if he gets a good report on his classroom's Ladybugs, then he gets a star. I was wondering about the Lady bugs. heheh.. My grand daughter does the same thing in her Kindergarten class but they use frogs. I love this. 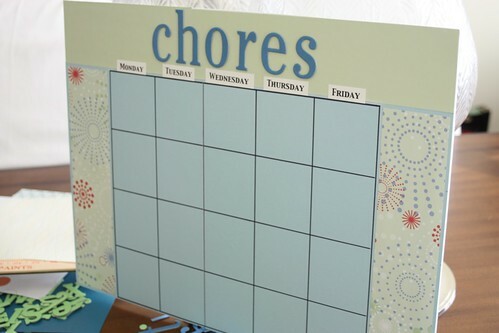 I've been thinking about having a couple of chore charts for my boys and this one seems perfect! Great idea! 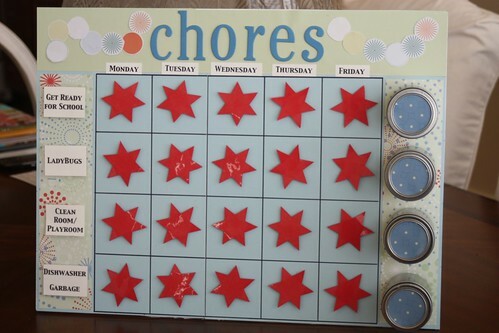 Years ago, I created a star/chore chart for my kids. It's been a while since I used one, but I think it helps motivate kids at any age. Cute! I love this! What a great idea. It looks great! That's darling. I got a question for you. So the tins hold the stars? So when they complete a chore, they get a star from the tins? I have been wanting to make a chart for my kids and this is awesome. Thanks for the idea! I like that the reward is right there in the tin! What a great idea. This is great! So cute! I'm always looking for great incentives for my kids to do their chores. We are doing a token system right now, but I'm sure the excitement of it will fade, so I may try this later on!